I’m Marie from Underground Crafter and I’m continuing a series of knitting stitches designed to help you take your knitting skills beyond the basics. I’m sharing each stitch as an 6″ (15 cm) square. I’ll show you how to join them together into a decorative sampler pillow at the end of the series. If you can cast on, knit, purl, and bind off, you can make these! This stitch is one I like to call Lattice Crust because it looks just like a tasty pie crust. 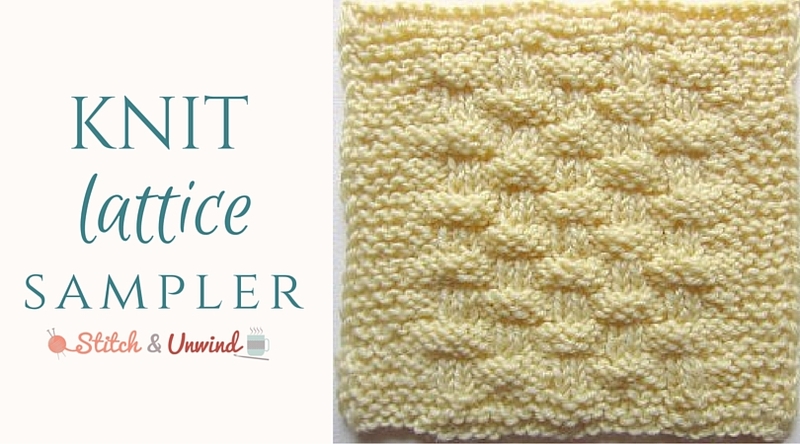 If you don’t want to make a sampler pillow, you can use this stitch for many other great projects. 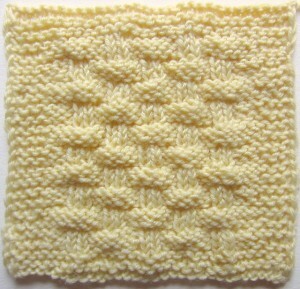 I think Lattice Crust would look great as a knit bag! The second square in our sampler combines knit and purl stitches to create a variation on the familiar basketweave pattern. CO 32 sts (or any multiple of 8 sts, + 8 sts, + 8 sts for border). Row 1: (RS): Sl 1, knit to last st, p1. Row 2: Sl 1, k6 *p2, k6. Rep from * to last st, p1. Row 3: Sl 1, k3, p3, *k2, p6. Rep from * to last 9 sts, k2, p3, k3, p1. Row 6: Sl 1, k10, *p2, k6. Rep from * to last 5 sts, k4, p1. Row 7: Sl 1, k3, p7, *k2, p6. Rep from * to last 5 sts, p1, k3, p1. Rep Rows 2-9 until square measures approximately 5.5 in (14 cm), ending after Row 5 or Row 9.